A keloid is a benign growth of dense fibrous tissue developing from an abnormal healing response to a cutaneous injury. It is characterised by extension beyond the borders of the original wound and growth in a pseudotumour fashion with tissue distortion and high recurrence rates after excision. The term keloid comes from the Greek 'chele' meaning crab claw like and was coined by Alibert (cheloide) in 1806 to differentiate keloids from cancerous overgrowths. Areas more commonly affected are the anterior chest, shoulders, flexor surfaces of extremities and the ears. 0Keloid of pinna has become increasingly common following the trend of ear piercing and these have cosmetic implications that significantly curtail the quality of life. The incidence of keloids is reported to be 2.5% of all ear piercings. Studies have shown that ear piercing after the age of 11 years is associated with a higher incidence of keloid formation. They may also follow drainage of auricular haematomas, repair of auricular trauma and as secondary recurrences following excision of keloids. The present study aimed to devise a standard protocol for treatment of auricular keloids with surgery and a combination of intra-lesional steroid injection and silicone sheet application. The rate of recurrence was assessed after a mean 16-month follow-up. This cohort study was carried out in outpatients presenting to the plastic surgery department of a tertiary care centre from January 2012 to December 2013. Approval for the study was obtained from the Institutional Ethical Committee. Patients were admitted into the study after due informed written consent. The exclusion criteria were pregnant and lactating mothers, concomitant illnesses (renal failure, hepatic disease, acid peptic disease, diabetes and hypertension) as a contraindication to steroids, history of treatment received for keloid in previous 6 months, duration of keloid less than 1 year, female patients unwilling to postpone pregnancy for 1 year and immunocompromised patients. Ten patients presented with keloids and the total number of keloids operated on was 22. The anatomical location of the keloid was noted to be the helix in all our cases with two patients having extension into the earlobe and two patients having involvement of antihelix [Table 1]. The patients underwent intra-lesional excision of pinna keloid with resurfacing of defect using keloid fillet flap. Intra-lesional steroid was injected into margins of keloid excision intra-operatively. Steroid used was triamcinolone acetonide 10 mg/ml, diluted in ratios with equal quantity of 2% lignocaine and given as 1 ml per cm 2 . Special emphasis was on achieving a tension-free closure, accurate coaptation of skin edges, adequate haemostasis, atraumatic handling of tissues and asepsis. A pressure dressing was applied at the end of surgery for 48 hours. Suture removal was done on the 14 th day. On the 21 st day, the second dose of steroid was given and the patient was commenced on silicone sheet application. On the pinna, microporous tape was used to hold the sheets in situ. This was worn for 12 hours per day at night-time for 3 months. The patient presented to Out-patient Department (OPD) after 6, 9 and 12 weeks for the subsequent steroid doses and thereafter at 6, 9 and 12 months for review. Patients were examined using serial measurements of maximum dimension of scar in two perpendicular planes using callipers and serial photographic documentation. A subjective assessment using Patient Observer Scar Assessment Scale (POSAS)  and an objective assessment by an independent observer using Beausang scale was performed at each visit. For POSAS assessment, the patient and observer assessed the operated ear while looking at a mirror in standard lighting in the OPD. For Beausang scale, an independent observer, blinded to time from surgery, assessed the patient in OPD. The data regarding scar assessment on follow-up is given in [Table 2]. The therapeutic aim of our study was to achieve at least 50% reduction of lesion by surface area with no recurrence at 12-months follow-up. Recurrence was denoted as post-operative emergence of growing or persistently symptomatic scar tissue. Symptoms were defined as pain, itching or pigmentation whereas growing scar was defined as thickening of scar, distortion of surrounding tissue or stiff raised scar. The patients were instructed to avoid further ear piercing or other trauma and to inspect the ear daily for any signs of recurrence. They were educated regarding side effects of the steroids and female patients were advised to avoid pregnancy for 1 year. After completion of 12 months, patients were contacted telephonically to report any recurrence. Recurrent cases received intra-lesional steroid as per the size of scar and were managed on OPD follow-up. Of the ten cases studied, six were secondary to ear piercing and four were secondary to burn injury. Female: male ratio was 9:1. All patients were in the age group of 18-30 years (mean: 23.2 years). Duration of the lesions ranged from 1 to 4 years. Three cases (30%) were relapsed pinna keloids having previously undergone surgical excision. Five cases had undergone multiple sessions of injectable steroids. Overall, 22 keloids were operated and all achieved total excision with coverage with keloid rind flap. Post-operative course was uneventful in all cases with no surgical site infections or flap necrosis. After healing by primary intention, all patients went on to receive the second to fifth dose of steroids while continuing silicone sheet application. One case developed adverse side effect of steroid (gastritis) during treatment necessitating postponement of one dose, whereas two patients developed menorrhagia after completing the dosage schedule and were managed conservatively. Telangiectasia and pigmentation were noted in two patients who resolved on follow-up. Patients were followed up from between 12-21 months (mean 16 months). [Figure 1], [Figure 2] and [Figure 3] portrays the clinical course of a post-burn helical keloid with no recurrence post-excision at 12 months. Keloids and hypertrophic scars are benign fibro proliferative lesions associated with proliferation of dermal fibroblasts. They usually present with tissue distortion, itching and hyperpigmentation. The etiopathogenesis of keloids is not clear, with many hypotheses being put forward, hence the development of a targeted intervention is difficult. Several mechanisms have been implicated in the formation of keloid tissue, including growth factor abnormalities, defective collagen turnover, changes in the orientation of collagen fibres due to tension, immune system dysfunction or hypersensitivity to sebum. Corticosteroid injections can be used to treat keloids in three ways: as adjuvant therapy combined with surgery, as monotherapy treatment of keloids and, as a component of multimodal therapy for the treatment of symptoms. Corticosteroids reduce fibroblast proliferation, collagen and glycosaminoglycan synthesis and suppress pro-inflammatory mediators. The commonest used corticosteroid is triamcinolone acetonide. Its dose range varies from 10-40 mg/ml and it is given at durations between 3 to 6 weeks. Common side effects of triamcinolone are hypo and hyperpigmentation, skin atrophy, telangiectasia and ulceration. 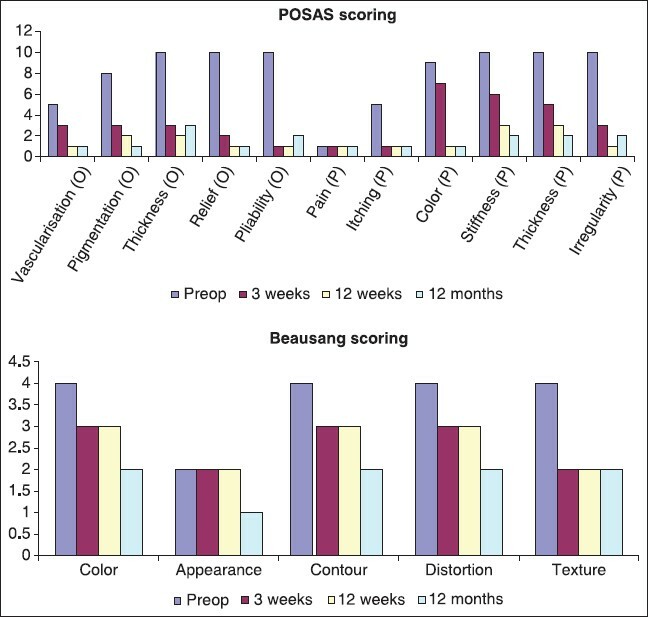 In our study, telangiectasia resolved on completion of steroid dosing and the decrease in pigmentation benefited all patients with a good response of pigmentation seen in POSAS scores. Three patients developed minor systemic steroid related complications. However, we were able to complete all cycles of steroid therapy in all three cases. Occlusive dressings such as silicone gel sheets have been recommended for a minimum of 12 hours per day on scars and keloids. Occlusion and hydration are the major effects of silicone dressing. They also bring about a significant reduction in pain, pruritus and erythema. Radiation modality was not employed in this study due to non-feasibility of referral for radiotherapy on an outpatient basis. The fillet flap technique used by this study results in superior aesthetics as it provides local tissue of similar colour and contour for resurfacing the defect. Intra-lesional excision with preservation of a keloid rind splints the suture line thus avoiding tension. Preservation of the subcapsular plexus in the keloid ring flap preserves vascularity and allows uneventful healing. There is no donor site morbidity associated with this procedure. Since there is no requirement for graft take, intra-operative instillation of corticosteroid causes no problem of tissue healing. In our study, all patients progressed with uneventful wound healing and with no incidence of flap necrosis. This enabled timely post-operative steroid prophylaxis to continue. In a previous study, triple keloid therapy has been demonstrated to result in 12.5% recurrences at 13 months. However, the process has been described as tedious, time-intensive and expensive. Patients in another study underwent surgery and steroids weekly for 5 doses and then monthly for 4-6 doses, documenting symptomatic relief after 5 weeks. Our study limited steroid dosing to five doses commencing intra-operatively and subsequently at 3 weekly periods and demonstrated a 9.1% recurrence rate at a mean of 16-months follow-up. Since the primary presentation was with pinna distortion, all patients achieved symptom relief in the immediate post-operative period. All studied patients said they would recommend the procedure to an acquaintance with pinna keloid. This promises a simpler, less radical method of managing pinna keloids with greater patient satisfaction and compliance. 1. Prabhu A, Sreekar H, Powar R, Uppin VM. A randomized controlled trial comparing the efficacy of intralesional 5-fluorouracil versus triamcinolone acetonide in the treatment of keloids. J Sci Soc 2012;39:19-25. 2. Sand M, Sand D, Brors D, Altmeyer P, Mann B, Bechara FG. 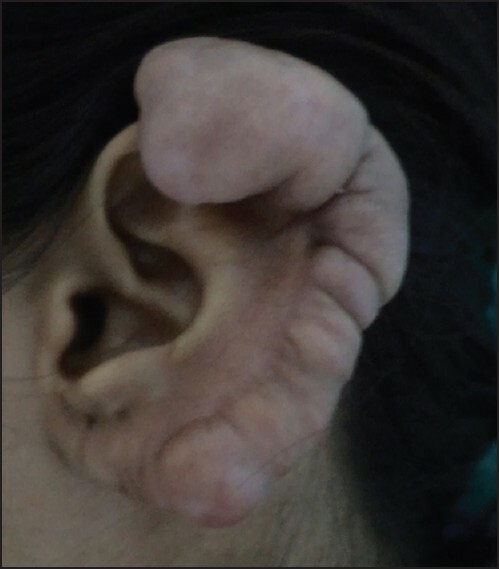 Cutaneous lesions of the external ear. Head Face Med 2008;4:2. 3. Lane JE, Waller JL, Davis LS. 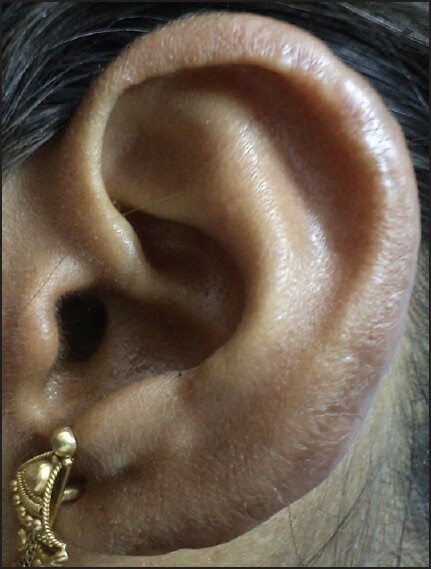 Relationship between age of ear piercing and keloid formation. Pediatrics 2005;115:1312-14. 4. Gupta S, Sharma VK. Standard guidelines of care: Keloids and hypertrophic scars. Indian J Dermatol Venereol Leprol 2011;77: 94-100. 5. Draaijers J, Tempelman FR, Botman YA, Tuinebreijer WE, Middelkoop E, Kreis RW et al. The patient and observer scar assessment scale: A reliable and feasible tool for scar evaluation. Plast Reconstr Surg 2004;113:1960-5. 6. Ogawa R. The most current algorithms for the treatment and prevention of hypertrophic scars and keloids. Plast Reconstr Surg 2010;125: 557-68. 7. Mustoe TA, Cooter RD, Gold MH, Hobbs FD, Ramelet AA, Shakespeare PG, et al, International Advisory Panel on Scar Management. International Clinical recommendations on Scar Management. Plast Reconstr Surg 2002;110:560-71. 8. Yang JY, Yang SY. Are auricular keloids and persistent hypertrophic scars resectable? The role of intrascar excision. Ann Plast Surg 2012;69:637-42. 9. Rosen DJ, Patel D, Freeman P, Weiss P. A primary protocol for the management of keloids: Results of excision combined with intraoperative and postoperative steroid injections. Plast Reconstr Surg 2007;120:1395-400. 10. Lee Y, Minn K, Baek RM, Hong JJ. A new surgical treatment of keloid: Keloid core excision. Ann Plast Surg 2001;46:135-40. 11. Kim DY, Kim ES, Eo SR, Kim KS, Lee SY, Cho BH. 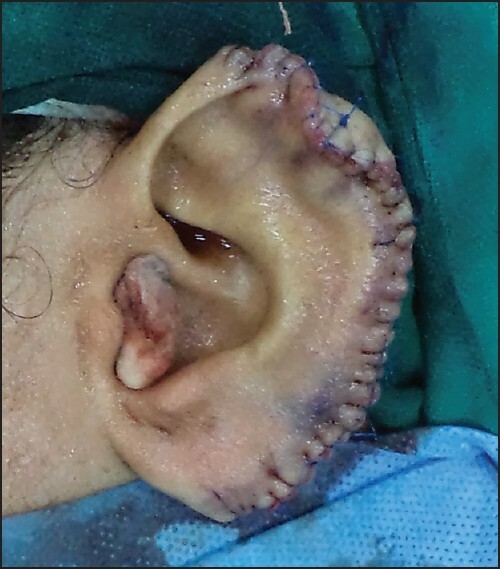 A surgical approach for earlobe keloid: Keloid fillet flap. Plast Reconstr Surg 2004;113: 1668-74. 12. Kauh YC, Rouda S, Mondragon G, Tokarek R, diLeonardo M, Tuan RS, et al. Major suppression of pro-alpha1(I) type I collagen gene expression in the dermis after keloid excision and immediate intrawound injection of triamcinolone acetonide. J Am Acad Dermatol 1997;37:586-9. 13. Berman B, Perez OA, Konda S, Kohut BE, Viera MH, Delgado S, et al. A review of the biologic effects, clinical efficacy, and safety of silicone elastomer sheeting for hypertrophic and keloid scar treatment and management. Dermatol Surg 2007;33:1291-302. 14. Agbenorku P. Triple keloid therapy: A combination of steroids, surgery and silicone gel strip/sheet for keloid treatment. Eur J Plast Surg 2000;23:150-1. 15. Chowdri NA, Masarat M, Mattoo A, Darzi MA. Keloids and hypertrophic scars: Results with intraoperative and serial postoperative corticosteroid injection therapy. Aust N Z J Surg 1999;69:655-9.